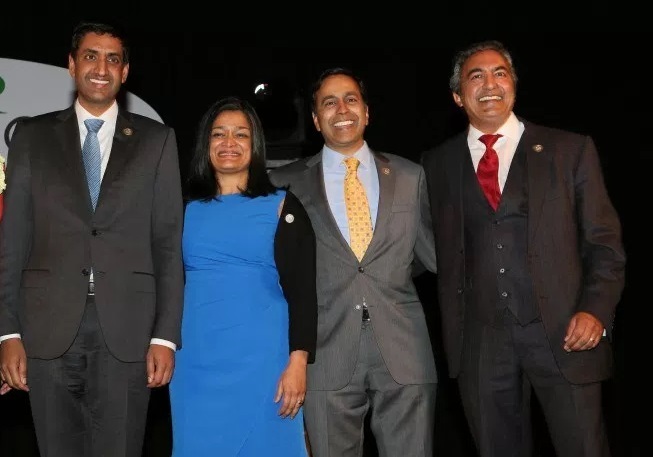 From left: Indian American members of Congress Ro Khanna (D-Calif.), Pramila Jayapal (D-Wash.), Raja Krishnamurthy (D-Wash.) and Ami Bera (D-Calif.). Besides the four incumbents, dozens of Indian Americans will be on the ballot across the country on November 6. Opinion: More than 50 Indian Americans will be on the ballot nationwide, but the election is not just about these candidates. Every election year, we hear these words from friends, family, and the media. To some extent, it’s understandable. The high-stakes nature our elections naturally produces heightened emotions and frayed nerves, fervent hopes of victory and doomsday predictions of the consequences of losing. But for Indian Americans, this truly is the most important election of our times. We have a lot at stake, starting with our candidates. A record number of Indian American candidates – by our count, over 100 – ran for federal, state, or local office this year. And after a highly competitive primary election season, this Election Day, over 50 Indian Americans will be on the ballot from coast to coast. That cohort includes a record number of candidates seeking to expand, perhaps even double, our ranks in Congress, as well as candidates seeking to become the first Indian Americans ever elected in the states of Arkansas, Florida, Indiana, and Kentucky, and to the state legislatures of Arizona, Illinois, New York, and Texas. Just by running, these candidates have inspired hundreds of aspiring public servants to consider running for office themselves. And if elected, they will carry our voices and experiences to the halls of power – where too often, we are unrepresented. But this election is not just about our candidates; it’s about what’s at stake for our community. Since the 2016 election, the Indian American community – as well as the broader South Asian community and Hindus, Sikhs, and Muslims – have experienced rising racism, xenophobia, and hate violence from Kent, WA to Kansas. According to South Asian Americans Leading Together (SAALT), there was a 45% increase in hate violence against our communities between Election Day 2016 and Election Day 2017. That kind of hateful sentiment has also infiltrated our politics. In New Jersey, two radio hosts referred to the state attorney general Gurbir Grewal, the first Sikh attorney general in American history, as “turban man.” And in hotly contested Congressional campaigns, candidates like Aftab Pureval and Sri Kulkarni have been subjected to thinly veiled racist and xenophobic attacks by their opponents’ campaigns. In addition, Indian Americans are especially vulnerable to a recent announced rule change by the Trump Administration to rescind work authorization for spouses of H1-B visa holders, putting at risk tens of thousands of Indian Americans, mostly women, and their families. With so much at stake, the question is: will we actually show up? There’s reason to believe we will. Just in the last year, new grassroots efforts focused on harnessing the desi vote and supporting our candidates have sprung up in Seattle, Detroit, and Atlanta. And for the first time, campaigns like Ram Villivalam’s state senate race in Illinois and Sri Kulkarni’s congressional race in Texas are targeting Indian American voters in a significant and systematic manner. In addition, a recent poll of Asian American voters reveals three interesting trends. First, that 90% of Indian Americans plan to vote this November. Second, that among Asian Americans, Indian Americans are the most enthusiastic about voting this year than in past years. And third, that Indian Americans are the most worried about how divided America has become. If, in fact, our community shows up at these levels, we can be the margin of victory in key Congressional races in Houston (TX-22), Detroit (MI-11), Atlanta (GA-06), and Northern Virginia (VA-10), all districts with a significant Indian American population, not to mention a handful of down-ballot races. Building political power takes years – sometimes even decades – of work. If Indian Americans want to be taken seriously as candidates, donors, voters, and advocates, we have to show up every election, not just in Presidential years. If we do, notwithstanding our relatively small numbers, we can have an outsize impact on politics, policy, and the future of America.